Featherhaze: WHAT TO WEAR // Wear the summer! As you probably know, I'm working as an editor at SWYF. We got a special blogitem called 'What to wear'. Every day someone else is showing an outfit. I wanted to share my look of last week with you guys. Oh my! Finally summer! Last week it was time for bare legs and strappy sandals. I've already worked most of these sunny days so last Thursday I enjoyed the sun in my garden and during the evening it was time for a barbecue with my friends. 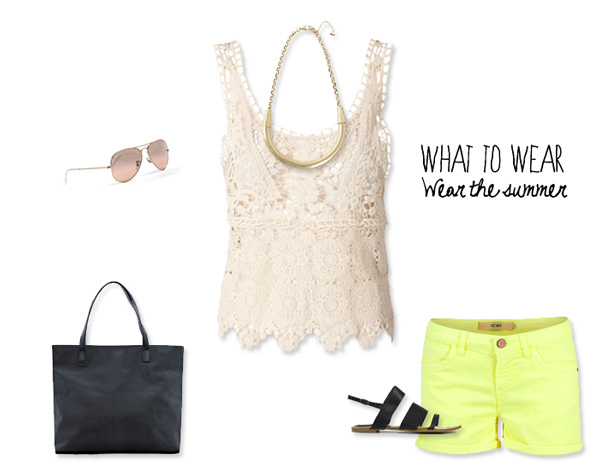 Some summer inspiration with my what to wear: wear the summer. With temperatures likes these I rather wear flat sandals than high heels. The weather is so comfortable and so will my outfit be. A yellow shorts of Ichi, which I adore. And of course a lace top (have you noticed I always put lace items in my looks?). Don't forget to bring your sunscreen and a bottle of water wherever you go, so this big bag of Mango is perfect for all your stuff. Enjoy your day, wear the summer!